I’m at the point of wedding planning (less than 2 weeks out!) where I’m having wedding stress dreams. Oy. Last night I dreamt that it was one hour before the ceremony, but I hadn’t figured out the backdrop NOR HAD I SHOWERED IN DAYS. Yeah. Good luck making all of that happen in the hour before the ceremony. I’m not sure how that scenario panned out, but I’m hoping the real deal goes a lot smoother! It’s only family, after all, so hopefully they’ll understand if we do hit any bumps in the road! Despite the weird dreams, this week has been going well thanks to this kale chickpea salad with creamy miso dressing. I made a big batch on Sunday and have been loving my leftovers (hot or cold!) for lunch the last few days. 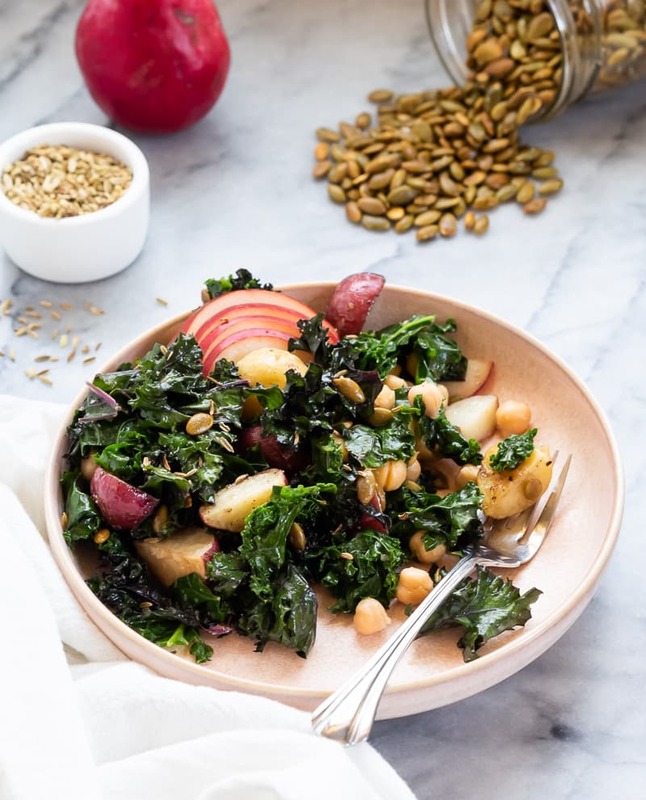 It has tons of kale, but is hearty and filling with the fingerling potatoes and chickpeas. 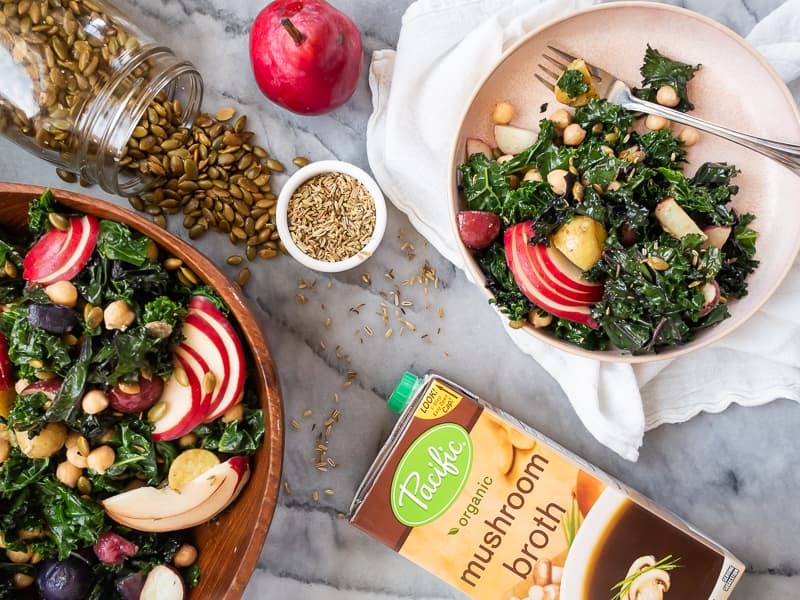 I used Pacific Foods Organic Mushroom Broth both to cook the chickpeas AND in the creamy miso dressing, so there’s a wonderful depth of flavor all around. I’m not including it in the recipe, but I will admit: I’ve added cheese to this a few times. I had manchego on hand, so I just crumbled some in and found it to be DELIGHTFUL! 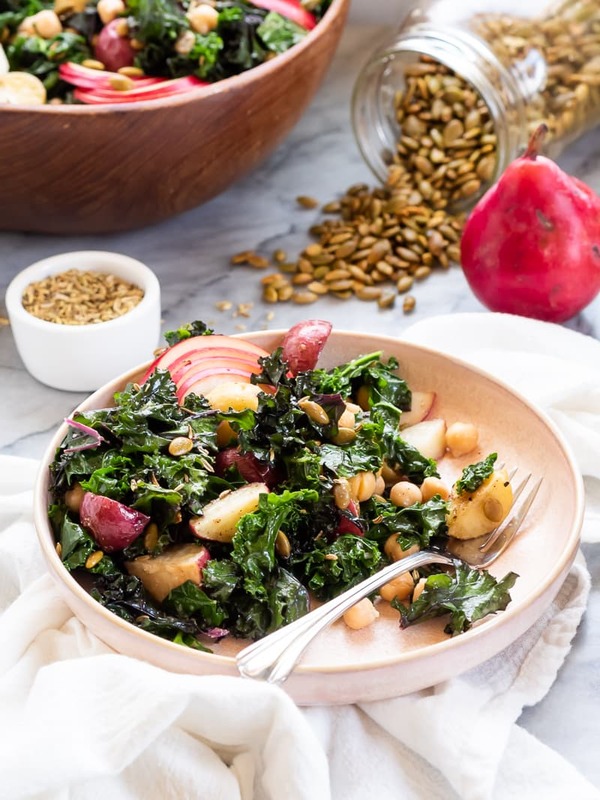 This hearty salad has chickpeas cooked in mushroom broth, kale, fingerling potatoes, pepitas, fennel, and a creamy miso dressing. Soak the chickpeas in water, covering by 2-3″, for at least 8 hours. After they’ve soaked, drain and rinse. Add to a small pot with the 3 cups of Pacific Foods Organic Mushroom Broth and cook for 40-50 minutes, or until tender. While the chickpeas are cooking, preheat the oven to 425F. Cut the fingerling potatoes into small pieces, toss in olive oil, salt, and pepper. Spread in a single layer on a baking sheet and cook until fork-tender and slightly browned. 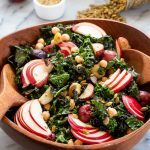 When the chickpeas and potatoes are just about done, steam the kale for just a few minutes — it should be bright green and still have some structure, rather than totally wilting. Remove from the steaming pot immediately. To make the dressing, use a blender or immersion stick to blend together all of the dressing ingredients. Add salt and pepper to taste. 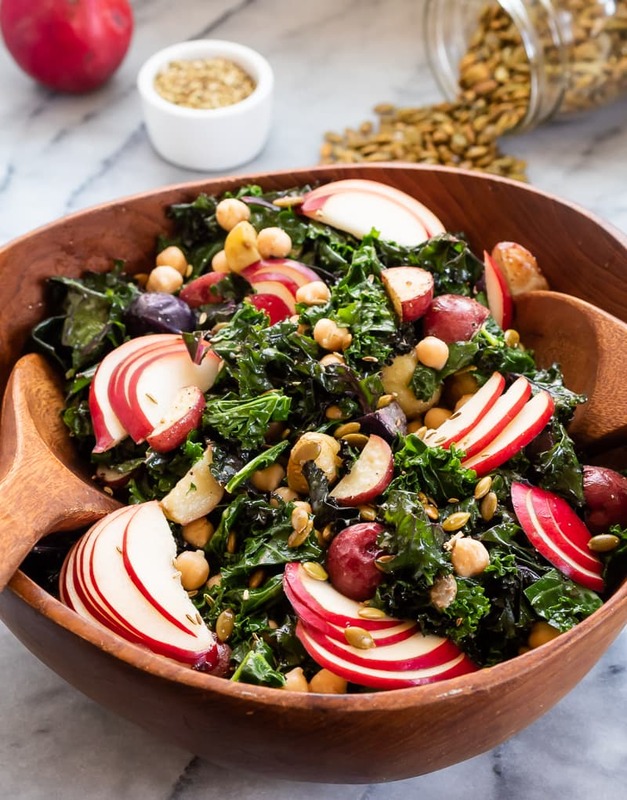 Combine all of the ingredients in a large salad bowl and toss to combine. Garnish with sliced pears. Serve warm, or cold!